Headphones are not a category we usually cover at AnandTech, and even when we do, it is restricted to gaming headsets. In my CES visits over the last several years, I have been fortunate to have a bit of spare time to go around the show floor and look at the various interesting gadgets about to make an appearance in the market. Many of these gadgets are, like headphones, only tangentially related to our core coverage areas. AfterShokz is one of the companies that has managed to grab my attention several times on the CES show floor. Their product is quite unique - bone conduction headphones that do not require something placed right over the ears to experience sound. Right since the introduction of the AfterShokz Sport in early 2012, they have been working to bring more features and better usability to the models in their lineup. After CES this year, I got the opportunity to spend some extended time with the AfterShokz Trekz Titanium as well as the Bluez 2. Bone conduction is the transmission of sound directly to the inner ear through the bones of the skull. It bypasses the eardrum (part of the middle ear) completely. While the aspect has been known for a long time (at least since the Beethoven era), commercial products (such as hearing aids and military use equipment) started appearing only in the 1970s. As usual with niche technology, the pricing was too high for mainstream adoption. In 2002, Goldendance, a Japanese company, was founded with the aim of doing R&D on bone conduction as well as to design and manufacture the transducers used for bone conduction. The products were brought to the US in 2008 under the Audio Bone brand. The Audio Bone headphones are still being sold - however, over the last 8 years, only two models have been introduced, and the pricing has been a bit out of the league for the average consumer. The Japanese market saw a few bone-conduction headset models from the likes of Maxell and Thanko. In the US market, Tier 1 vendors such as Motorola tried to bring bone conduction headsets to the mass market with devices such as the Endeavor HX1 Bluetooth headset. Unfortunately, they didn't make much of an impression in the market. AfterShokz entered this area in 2012 with the launch of the Sport headphone. After checking out the AfterShokz Sport at CES 2012, I felt that the product seemed interesting, but with a narrow focus and clunky UX. The wired model required a USB adapter with a headphone jack to charge and came with a in-line battery / volume control box that needed to be secured during usage. However, over the last four years, the models have evolved quite a bit. Since then, they have managed to introduce new wired models such as the Sportz 2 and the Sportz M2 in late 2012 (the latter being the first bone-conduction headset to integrate a microphone). In 2013, the first wireless Bluetooth-enabled model - Bluez - was launched, while Bluez 2, the second generation version, started shipping in June 2014. In 2015, AfterShokz had a successful crowdfunding campaign for a new wireless model - the Trekz Titanium. Launched in late 2015, it is a Bluetooth enabled wireless headset with noise-cancelling dual microphones that can be used seamlessly for even taking phone calls while listening to music. Even though AfterShokz claims that the battery life is only for 6 hours, I found that both the Trekz Titanium and the Bluez 2 easily exceeded the claimed usage time. It is quite possible that the battery life was measured at a volume level that is a bit higher than what I am comfortable with. Since the Trekz Titanium happens to be the flagship model, I will devote the rest of this section to it. Compared to the Bluez 2, the frame of the Trekz Titanium is more flexible, and that allows for a more comfortable fit. In addition, AfterShokz also bundles silicon rubber bands to place on either side of the headset (for a better fit in certain cases) and earplugs (to block out external noise when using the Trekz Titanium in noisy environments). There is also a carrying case in the package along with the user manual and the warranty card. Two of the main issues with bone-conduction headsets relate to the improper reproduction of certain frequencies and the leakage of sound to the surroundings. AfterShokz has some DSP tricks under the trademarked 'PremiumPitch' and 'PremiumPitch+' tags to provide good experience with both music and voice. On the leakage front, AfterShokz claims implementation of some sound cancelation features under the 'LeakSlayer' tag for this purpose. The titanium frame of the Trekz Titanium allows for it to be thin and flexible. The rest of the observations in this section are applicable to both the Bluez 2 as well as the Trekz Titanium unless specifically noted. The weight is equally distributed on either side, which aids in a more natural fit. On one side, we have the battery, and the other side has the volume / power control, micro-USB charging port and the main circuitry / antenna. All the buttons as well as the micro-USB charging port are on one side, with the micro-USB slot having a flap to protect it against ingress of liquids and dust. The power button is multiplexed with the volume increase button (long press to activate power functions). The outer shell of the left-side transducer has a multi-function button that can be used to take calls and skip tracks during music playback. The positioning of this button is perfect, though I can't say the same about the volume buttons. I tended to frequently keep pressing the micro-USB flap when trying to power on the device or alter the volume. Sometimes, I also mistakenly ended up raising the volume instead of lowering it. Nothing about the industrial design can be termed as a show-stopper, but there are always a few aspects that could be improved in future generations.. That said, the industrial design of the Trekz Titanium addresses one of the major issues with the Bluez 2 (inflexibility and, as a result, fit in certain cases). The galleries below show the internals of both the Bluez 2 and the Trekz Titanium (from the official FCC filings). The Bluez 2 utilizes the CSR8645 Bluetooth Stereo ROM solution with aptX technology. 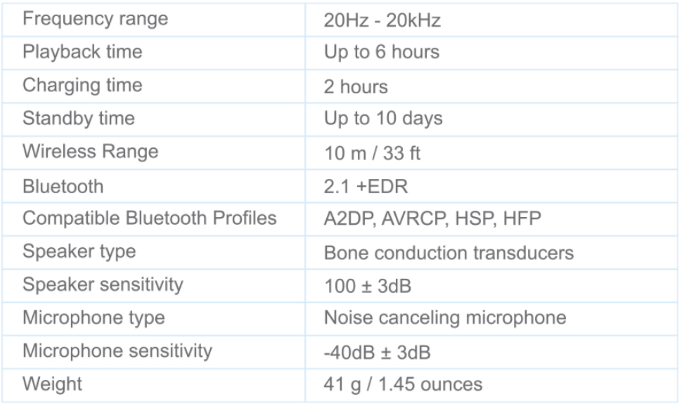 Interestingly, the official specifications for the Bluez 2 don't indicate aptX codec support. The Trekz Titanium uses a 3.7V 180mAh battery and also uses a CSR chip, though the chip markings are not clear. As an average consumer, I don't expect audiophile-quality headphones while being on the move or exercising. Also, unlike the typical consumer, I am averse to having anything covering my ears. As a result, I have never cared about headphones or headsets till affordable alternatives such as the AfterShokz models came out. I have used the Bluez 2 as well as the Trekz Titanium for a hour at a time (mainly during my bike ride to work), and I have only had positive experiences to report. I can definitely see that extended use might cause discomfort, particularly since bone conduction needs some getting used to. Despite the claimed 'LeakSlayer' technology, there is some amount of sound leakage in both models. It is possible to bring down the volume without adversely affecting the effectiveness of bone conduction. The sound leakage also seemed to be reduced in the Trekz Titanium when compared to the Bluez 2. People wearing glasses need to adjust the units to get the right fit. While this adjustment is easier in the Trekz Titanium, the Bluez 2 is a bit rigid. In general, even with the Trekz Titanium model, being able to adjust the position of the transducers independent of the rest of the frame would be a very useful feature. Limited buttons on the unit make user interaction a non-intuitive affair. However, reading through the manual once should clear up this aspect. It might be a better idea to have the two volume buttons on either side (given that the Trekz Titanium design multiplexes the volume up and power buttons). Obviously, it goes without saying that this is not a product for audiophiles. I did notice multiple reports online of users finding that AfterShokz units stop working under excessive sweat. This was not an issue for me, but I can see that it could affect certain users. The Trekz Titanium carries a IP55 rating pointing to sweat-resistance (the rating for liquid protection implies that there would be no harmful effects to the device from water projected by a nozzle (6.3mm) against it from any direction). AfterShokz claims to have a new sweat-proof coating in the Trekz Titanium and Bluez 2S to handle this situation, though its effectiveness is not something we were able to test. It would also be nice to have a carry case in which it would be easier to put the Trekz Titanium into without any twisting or bending. One undeniable aspect is that AfterShokz headphones like the Trekz Titanium and Bluez 2 can help people with damaged eardrums / middle ear issues to experience sound (assuming the cochlea / inner ear is not damaged). It is ideal for living room HTPCs where one can listen to the audio from the PC without disturbing the others in the room (applicable to any Bluetooth-enabled headset, but specific to bone-conduction models when considered with the above point). I am quite happy to see that AfterShokz is continuously widening the market appeal and usability of their products (having started with a limited use wired model back in 2012). Coming to the other vendors in this space, we have the Damson Audio Headbones at $140, the Raking Bone Conduction Hearing Aid at $50 (primarily targeting usage for dialog, and not music), a couple of Panasonic models and the pioneer for bone-conduction consumer equipment in the US - Audio Bone. I have not personally evaluated the others, but, it is clear that the competitors' pricing for equivalent products is easily 1.5x to 2x of what AfterShokz is marketing their model for. Additionally, online reviews also consistently indicate better satisfaction with the AfterShokz models. The Bluez 2 headphones is available for $80, while the next-gen Bluez 2S retails for $100. The Trekz Titanium is currently available only at AfterShokz for $130. If you are interested in just checking out whether bone conduction works for you, the plain vanilla wired model (no microphone) comes with a $40 price tag. "earplugs (to block out external noise when using the Trekz Titanium in noisy environments)"
in that case anybody would use traditional headphones and enjoy the better quality. 1) The killer app for me is running home from work while being able to hear what's happening around me - obvious reasons about avoiding getting run over. Given how many people are active nowadays I'm amazed the category isn't more popular. (same obviously applies for cyclists although I would hesitate to cycle in traffic with any distraction, open ear or not). 2) I'm no expert but compared to audiophile quality buds sound quality is undoubtedly sucky (I almost exclusively listen to podcasts so not an issue). NB I recently tried the Damson Headbones head to head with the Trekz and the audio quality was notable better/richer - although as I said probably not that impressive vs. normal buds/monitors/headphones. 3) The plastic on my Bluez 2 snapped randomly when taking it off. The big advantage of the Trekz is that the Ti band is much more deformable/flexible so that's not a worry. One worry is that the Bluez might get snapped in transit as it only comes with a soft case; one advantage of the Damson Headbones is that it can fold up in the carry case. Yeah.... Amazing Value NOT! UK Pricing is a joke, On average they are over twice the US sticker price. How can a pair of $39.00 phones become £50?Even taking VAT and Delivery there is NO excuse for price gouging on this scale. In fact after re-reading the end of the article regarding pricing, this isn't a 'capsule review', it's an advert in disguise (and a pretty poor one at that). To quote "Additionally, online reviews also consistently indicate better satisfaction with the AfterShokz models." PROVE IT. Where are your sources?